In September 2014, the State Council of China published the new reform guide for the College Entrance Examination (Gaokao) System. Shanghai Municipal Education Commission (SMEC) issued its own new reform and implementation plan in late September based on the national guidelines, sketching out an experimental blueprint for Gaokao reform in Shanghai that aims to alter the existing exam culture. The reform plan, which will influence the high school class graduating in 2017 and onwards, promises to profoundly reshape existing high school curriculum and teaching within Shanghai, as well as college admissions of universities nationwide. However, implementation of the reform plan faces profound institutional inertia in the educational system and internalized negative perceptions of the exam, as well as capacity deficits at various levels. This client-based Policy Analysis Exercise aims to provide a comprehensive analysis of the purpose and potential implementation problems of the aforementioned policy, and ultimately policy recommendations to the SMEC before the reform plan takes effect. In September 2014, the State Council of China published the new reform guide for the College Entrance Examination(Gaokao) System. Shanghai Municipal Education Commission (SMEC) issued its own new reform and implementation plan in late September based on the national guidelines, sketching out an experimental blueprint for Gaokao reform in Shanghai that aims to alter the existing exam culture. The reform plan, which will influence the high school class graduating in 2017 and onwards, promises to profoundly reshape the existing high school curriculum and teaching within Shanghai, and college admissions of universities nationwide, as well. However, implementation of the reform plan faces profound institutional inertia in the educational system and internalized negative perceptions of the exam, as well as capacity deficits at various levels, which we go on to explore later in our paper. These are among the many conceivable challenges involved in the implementation process, which will provide excellent Policy Analysis Exercise materials for policy recommendation and prediction. We use a combination of forward mapping (top-down analysis of the policy), disconnection frameworks (potential pitfalls caused by the design and goals not lining up with the tools available), and scenario analysis techniques to accomplish this. This Client-based Policy Analysis Exercise proceeds in five parts, aiming to provide a comprehensive analysis of the purpose, the potential implementation problems of the aforementioned policy, and the policy recommendations to the SMEC before the reform plan takes effect. Despite the fact that this experimental reform has many political aspects at both the both national and municipal level, the reform may face many challenges in implementation, such as unequal distribution of academic resources in high schools, students’ choice of subject remaining exam-oriented, and an unclear definition and maneuverability of the proposed Comprehensive Quality Evaluation (CQE). “Better policies would result, if policymakers would think about how their decisions could be implemented before they settle on a course of action”;thus our team uses the forward mapping policy implementation model, incorporates analysis of both the policy design and implementation—but with an emphasis on potential implementation challenge analysis by conducting in-depth interviews with key policymakers and advisors—as well as research on the policy documents in their present and previous forms. While the Shanghai plan is still pending adjustment,we examine the SMEC’s own revision of the policy and provide policy recommendations, such as detailed steps to improving the CQE System, resource allocation, solutions to a potential anti-corruption, and disruptive reform policy paradox etc., which may help the SMEC adjust and improve the policy before its full implementation in 2017. Reforms in Shanghai may serve as a testing ground for nationwide reforms set for implementation in 2020 (as has been the case with policies in other fields). The National Higher Education Entrance Examination (or NCEE, the National College Entrance Exam), commonly known as the Gaokao,has been the most important criterion for college admissions in China since its creation in 1952. Although the system was practically suspended during Cultural Revolution, it is still the primary avenue through which Chinese high school graduates have entered higher education institutions throughout the years. The contemporary Gaokao system was finalized in the late 1970s as part of a wider package of reforms to reconfigure the country’s crumbling social order after a decade of political turmoil, where the political background of candidates overrode academic performance as criteria for university admission. The Gaokao in contemporary times professes to return to a meritocratic ideal deeply rooted in China’s thirteen-century long imperial examination tradition; a high-stakes and rigid, yet unbiased, national exam through which candidates can succeed regardless of family pedigree,. Supporters of the Gaokao often paint the test as a meritocratic institution that promotes social mobility, but recently, the Gaokao has come under fire for its emphasis on disciplined learning and standardization of exam questions to ensure fairness and equity while trying to select innovative individual talents best suited for college education. Although a student’s Gaokao score is expected to faithfully reflect their academic performance in high school, the Gaokao system’s overemphasis on exam scores has long been criticized for overlooking students’ talents and interests. In an overly dominant exam culture, high school students in China are often pressured to study for the sole purpose of being tested on specific materials before they have the opportunity to explore personal interests. Educators, students, and parents have criticized the Gaokao’s emphasis on rote memorization as being detrimental to critical thinking skills. In addition, both the examination itself and the college admissions process are sometimes subject to wider political influences and corruption, as well as regional disparities in education capacity and arbitrary score inflations or deflations for athletic achievements, artistic prowess, etc. (although this has been trimmed back in recent years). Gaokao reforms started as early as 1985, when the Ministry of Education gave Shanghai the autonomy to conduct an independent exam. Education policy in Shanghai is managed by the Shanghai Municipal Education Commission, which has significant discretion in setting Gaokao policies. The Ministry of Education has been slow to provide these privileges to other provinces and cities. Despite this, Shanghai is not exempted from including the three subjects (Chinese, English, and mathematics) that are compulsory in all Gaokao versions across the country. Major reform efforts to improve the content and form of the test took place at the beginning of the new millennium and showed two tendencies targeting the aforementioned new developments in a changing educational landscape. 16 provinces and municipalities, including Beijing, Jiangsu, and Zhejiang, have been granted the freedom to reform and design independent exam papers of the Gaokao under the provision of the Ministry of Education. These adjustments of exam structure have focused primarily on altering the exam-oriented high school curriculum to one that values the “all-round development” of students. However, these attempts have been unsuccessful, and no substantial change has been realized in actual high school education. In September 2014, the State Council of China issued guidelines on future Gaokao reforms that aim to fundamentally reconstruct the Gaokao system, college admission, and, by extension, the nature of secondary and higher education. As the most populous city in China, Shanghai is at the forefront of Gaokao reform nationwide. A detailed plan released by the SEMC sketched out a timeline for Shanghai’s Gaokao reform: pilot reforms launched in 2014 will first alter high school curricula to prepare the incoming freshman class for the new Gaokao in 2017; full-scale reform will be implemented in 2017, and by 2020, Shanghai will have fully established a creative and contemporary Gaokao system tailored for the city’s specific needs. This system will adjust the exam’s content and improve the synergy between the High School Academic Proficiency Examination (Huikao)and the Higher Education Entrance Examination (Gaokao), and eventually establish a transparent system of holistic academic evaluation with diversified admission opportunities and methods. With over 150,000 students enrolled in Shanghai’s high schools and almost 370,000 in undergraduate programs, Shanghai’s education system, and the institutions it includes, is enormous in enrollment and number. Thus, any attempt at overhauling the Gaokao will have to factor in the vast scale of the system in question. Changes in the Gaokao plan will profoundly influence both high school education and the transitional stage from high school to college. With the diversification of the exam structure itself, and the diversification of college admission criteria, high school students in China will ideally be able to spend less time preparing for the Gaokao examination, and instead will discover fields they are personally interested in and gain more relevant knowledge in those fields to better prepare themselves for higher education. By moving from the “3+1+X” structure to “3+1” structure in 2011 (See Table 1), Shanghai’s earlier Gaokao reform removed the 30 points of integrated examination scores from the two day exam layout in order to lessen the burden on high school seniors to prepare for more subjects (See Table 2). However, the “3+3” structure to be implemented in 2017 reconfigures the entire exam framework. The reform touches on two areas that have always been left intact in past reform attempts and have remained essential to the national Gaokao guidelines: the compulsory Chinese, Mathematics and English tests, and the separation of Arts and Science Curricula in high schools. The Science curriculum usually allows students to study physics, chemistry and biology, while the Arts curriculum pigeonholes students into history, politics, geography. This clear-cut separation of the two curricula corresponds to the strategy used in universities admitting students into specific majors. The curriculum that students choose in high school functions as a prerequisite that makes students eligible to apply for a major in a university where their Gaokao score meets the university’s minimum threshold. Under Shanghai’s new reform plan, English will now be “degraded” to a test of lesser status that candidates are eligible to take twice, the higher score of which will be counted towards a student’s overall Gaokao score. Instead of basing students’ choice of electives on the Arts versus Science dichotomy, students will gain the freedom to take three out of six subjects of their choice as electives, hence the “3+3” moniker. The new policy will more comprehensively accommodate the personal academic interests of students into the usually rigid exam structure. The freedom to choose elective subjects means that students are now able to better focus on elective subjects they are either interested in or better with rather than struggle with subjects they are not necessarily interested in, but are required to take. This chance is designed to push high school students to consider future major choices long before post-Gaokao college admission. High schools will have to reconfigure faculty and resources to provide a diversified curriculum to students as well as encourage personal development outside of exam preparation in the classroom. To universities, students can specify three more flexible course requirements for different majors rather than the fixed Arts or Science curriculum requirement in the past. The requirements will grant academic departments in universities further autonomy to select students with talents or interests in particular disciplines. The Shanghai Gaokao Experimental reform proposes a bold complement to the university admission criteria, the “Comprehensive Quality Evaluation system” (CQE System, further elaborated on in this paper). Theoretically, the system will operate with a constantly updating evaluation document that reflects a student’s personality, interests, and extracurricular activities during high school. This new system will provide alternatives to the exam-score-only admission criteria, facilitating the selection of the most suitable candidates. In cases where the university needs to choose between candidates with similar Gaokao scores, the CQE document is able to represent students’ academic skills and personality outside of the Gaokao. The new plan involves a variety of stakeholders, from high school students to college admission officers. As illustrated in Table 1, the primacy of the exam as the only standard of college admission has long been a factor in the dissatisfaction experienced by almost all stakeholders. Students, parents, teachers, and administrators in high schools and colleges are all part of the deeply rooted exam culture, which places success in the Gaokao above any other student quality; students are willing to sacrifice other personal interests outside of academics for more time spent preparing for the exam, especially for subjects tested on the Gaokao that may not overlap with their academic interests or talents. High school teachers discourage students from engaging in any activities that will not benefit their Gaokao score, advising students to choose easier subjects on the Gaokao and spend more time on their “weaker” subjects. Recent changes that rolled back past policies of adding points on the basis of athletic or artistic prowess have only exacerbated this problem.College educators and administrators have stated that although the Gaokao score is an incomprehensive indicator of a student’s actual ability, they have to rely on and make use of the existing Gaokao system for the time being as there are no better alternatives. Although the reform goal seems to be addressing issues that greatly overlap stakeholder dissatisfaction, stakeholder perceptions of the new reforms nevertheless appear to be pessimistic. Many students and parents are likely to resist new changes. The reform has put a great deal of pressure on high school students graduating in 2017. As it remains a high-stakes exam, the reformed Gaokao puts these students, and by extension their parents, into an unfamiliar situation where educators, administrators, students, and admission officers are all facing a drastically reformed exam and admission criteria. Usually, change in exam structure incurs an unpredictable change in materials covered by the exam, making the first ever exam much harder to prepare for than an exam that has been in place for more than three years. Although there has been long-term dissatisfaction towards both Gaokao and the rigid exam culture it has imposed on society, most students would still prefer an exam that has been tested carefully regulated to a completely new exam. However, there may still be a substantial number of students who are likely to support the use of the reformed and more flexible new exam system, considering it a better alternative to the old system. Although students and parents do not have much of a choice as the Gaokao remains the only channel to higher education in mainland China, their reluctance to support reform might motivate them to approach the reform negatively through overturning wider objectives of the reform to obtain higher exam scores. For example, students and parents have more incentives to choose elective subjects that appear to be easy in order to score well instead of the ones they are genuinely interested in. Similarly, they might also choose subjects according to the old science and arts curriculum to avoid the risk of being excluded from a prestigious college major. As specific regulations on the CQE system are still under review, parents may be motivated to pay bribes to school officials for a better CQE assessment in order to secure their child’s success in college admission. High schools will face fundamental challenges in resources and curricula in order to accommodate changes in the Gaokao system. As the curriculum now provides more than twenty combinations of subjects, the conventional model of Chinese classes (where teachers come into fixed classrooms to teach fixed groups of students), will no longer be valid. Alternatively, high schools will need to invest large amounts of resources in restructuring class models and arranging students to go to different classrooms to take classes of their choice. Considering the size of the student body in Chinese high schools, the incurred transactional cost of the reform appears to be extremely high even for resource-abundant high schools, as almost all operating procedures in high schools will have to be reformed. Teachers in particular have to adjust to the new “walking class” model of teaching and will have to teach far more students than they are used to. Similar to students, teachers and administrators too cannot explicitly reject the mandated reforms. However, high schools might restrict a student’s choice of subjects to the several most common combinations and thus retain the old model of classes due to resource constraints. Admissions directors and other university personnel, in line with current and past initiatives, will most likely support the movement towards a more international model of education as part of their wider goals in this arena. *Many top Chinese universities are permitted to create tests independent from the Gaokao to select students with particular talents. Most of these universities ended up joining one of the three independent admission blocs to conduct such assessments: the Peking Union, the Tsinghua Union, or the Excellence Union. These institutions are at the top tier of Chinese universities. Only a modest portion of students can be admitted through this channel in most of these universities. Therefore this development in Chinese university admission is not representative of the admissions system as a whole. The main aim of the experimental reform is a more holistic evaluation of high school students, which addresses the long-existing concerns of stakeholders that a Gaokao score alone cannot faithfully represent a student’s quality. The short exam period is not considered to be an accurate reflection of a student’s academic performance throughout high school, let alone the overall quality of a student. A once-and-for-all exam score fails to do justice not only to students whose intellectual talents cannot be given credit in the existing exam structure, but also students who consistently excel in academics in high school but fail to do well during the. By diversifying the exam’s structure and college admission criteria, the reform endeavors to take into consideration students’ individual talents and extracurricular achievements outside of their Gaokao exam score. The new policies also deal with the tension between fairness and attempts at “all around development” experienced in unsuccessful past reforms that only pressed high schools and students to adopt a broader curriculum without altering the exam structure of the Gaokao. 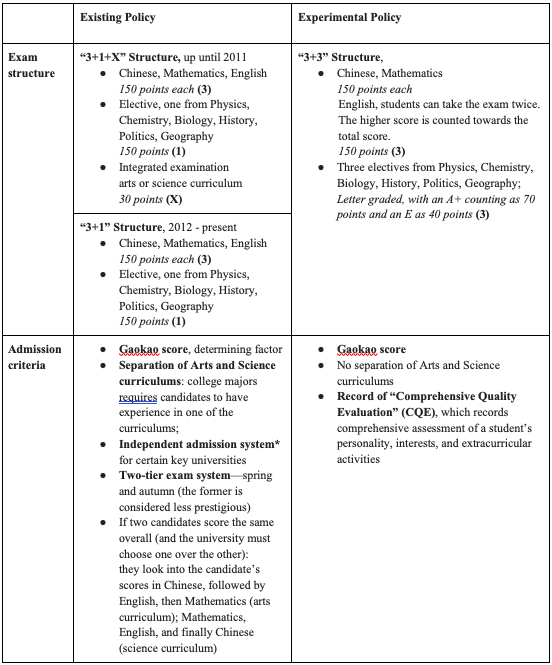 The overarching social objective of the exam (meritocratic equality of opportunity) conflicts with the educational objectives internal to the Gaokao: on the one hand, a nondiscriminatory exam is the major tool to promote greater equality and social mobility in China’s increasingly stratified society; on the other hand, the educational objective of the exam—to select the most suitable students for higher education—calls for fundamental reform that deemphasizes the test-taking ability of students in deference to critical thinking skills and unique talents. At the high school end of the reform, these new policies aim to provide students with more channels to be evaluated in the college admission process and more opportunities to experiment in different fields of study before they select their college majors. On the university end, the reform aims to assist schools in selecting students with talents they think are best fitted to each individual academic environment and university culture. However, to a large set of high school students who lack access to resources that cultivate abilities essential to these new criteria (more teachers, competent administrators, technology, etc. ), the reformed Gaokao threatens opportunities for higher education, as these new criteria move away from the standardized, objective exam questions and resulting score. The official reform guideline issued by the State Council lists eight more general goals at the social impact level: to improve on past reforms; to improve the quality of education; to improve social consciousness; to promote social mobility; to fit into the larger picture of modernization; to improve the maturity of students; and to develop the talents of young people that will “make historical contributions to Chinese society”. These objectives answer to all the existing general concerns of Gaokao expressed over the years but all fall into efforts to address the two aforementioned main tensions. ● Instrumental disconnection: disconnection between the reform design and the realities of learning and teaching in leading schools. ● Intellectual disconnection: disconnection between purpose, thrust, and content, both within and between different reforms. This type of disconnection has at least two faces— lack of coherence and lack of consistency. Coherence relates to whether different reforms are explicitly linked to one another. Consistency refers to the uniformity of the messages conveyed by individual reforms and the extent to which they are open to interpretation by the various actors involved. ● Cultural disconnection: disconnection between what the reforms demand and the cultural realities of teaching in schools. It differs from instrumental disconnection in that it focuses on values and ingrained understanding rather than the more overt structural features of schools. ● Political disconnection: disconnections between the reforms, broader governance and political structures, and the established order underpinning life in the Chinese education system. It also refers to disagreement over the political rationale and ideology behind the reforms. Political disconnection also occurs at the micro-level within the school. ● Communicative disconnection: deficiencies in how reforms and their outcomes are explained, communicated, and sold within and outside the education community. Current reforms demand the implementation of the “walking class” system, where students rotate between classrooms and are given a greater degree of flexibility in selecting courses. Street-level bureaucrats— in this case, teachers—may exhibit the type of tokenism described in Weimar and Vining. In this situation, the merit pay system may actually help enforce compliance. Assigning specific merit incentives as part of the reform package may help foster adoption; alternatively, altering the initial focus of the policy to only target high-performing “exemplary schools” where instructors are already treated well may be as beneficial. Incorporating a training period for teachers to adapt to the new system is another potential adoption incentive, although the logistics of this solution are difficult and will vary from school to school. Provision of the appropriate training for teachers would be well worth the additional expense. Coherence and consistency are not major issues with Shanghai’s reforms, with the exception of two nebulous goals—”political/ideological education” and “strengthening social consciousness.” The SMEC’s policy document lays these out as part of the CQE, but does little in the way of connecting the CQE and these goals. Subjectivity may play a significant role in these two criteria. These goals also may conflict with the SMEC’s stated goals of increasing social mobility and modernizing China as a whole. If a student’s political leanings are not in line with those of his or her CQE evaluator, what options are available to the student? Social mobility is also compromised by these two criteria, as political leanings are heavily influenced by socioeconomic factors. These criteria potentially put poor migrant students at an even greater disadvantage relative to their peers; for example, they may be economically unable to perform the community service that serves as one of the criteria for “social consciousness.” As such, redundancies should be built into the CQE system along the lines of the aforementioned suggestions to prevent delegating too much discretion to individual actors. Chancellor Yu described a cultural disconnection during our interview—as a result of the enormous amount of participants in the Chinese educational system, simple numbers like the Gaokao score are seen as a more suitable way to gauge a student’s abilities than the complementary methods proposed by the reform. Resolving this disconnection is not possible through direct intervention or changes to the policy. The only solution is to allow the reforms to play out and allow stakeholders to witness improved outcomes, thus changing the cultural attitude surrounding the Gaokao. The forward mapping model of implementation analysis helps to generate insightful observations of the reform policy that allow us to discover potential implementation problems within the reform plan. SMEC, the major actor in the reform, bears two parts of responsibilities: devising policies and local decrees for implementation, and supervising the adoption of the reform in both high schools and universities. The SMEC relies on the Shanghai Municipal Education Examinations Authority (SMEEA); though independent from SMEC, SMEEA is still a governmental agency expected to implement the technical aspects of educational policies regarding the Gaokao and college admissions, and has very clear boundaries to its duties. The reform package itself targets mainly high schools, the SMEC considers universities in relatively good condition already; additionally, the SMEC does not wield absolute authority over universities.. However, the influence the SMEC holds beyond the educational institution is limited. There is no direct way for the SMEC to guarantee that students adapt to the new policies, nor can they directly control the actions of parents who prefer the old system. Universities outside of Shanghai may not adopt the progressive admissions policy, discouraging students from applying to these institutions and limiting the reform’s effects only to schools in the city. Additionally, pushback from third-party educational services—a highly influential bloc— is almost inevitable, as their business models depend on preparing students for the old iteration of the Gaokao exam. In some cases, schoolteachers have been found to leave out large portions of Gaokao-based materials from class time in an effort to push students into their own after-hours prep programs that supplement their incomes. An additional enormous problem in implementing the reforms is their lack of clarity. In a March 2015 interview, Chancellor Yu Lizhong described the SMEC’s current stance as more “a set of guidelines than a concrete set of new policies.”Incremental change is the initial objective, while the overall aim is to move the focus away from small adjustments to the exam and instead change the overall culture of secondary and higher education. One of the SMEC’s first steps toward this goal is to boost the prestige of the spring term Gaokao, which is traditionally considered to attract lower-quality applicants and fewer students. By allowing currently enrolled high school students to take the spring Gaokao, the SMEC aims to equalize the status of the spring and autumn exams, creating a more level playing field and reducing the enormous pressure on students that the two-tier Gaokao system creates. However, it is still necessary for the reforms to be clarified, especially in the area of the Comprehensive Character Evaluation, as unclear directives inevitably lead to unclear results. The extensive projected time frame of the reforms creates mixed benefits. On one hand, the SMEC is given a longer period to adjust and implement the reforms, as well as more time to deal with problems that may emerge. On the other hand, the policies will take a long time to bear fruit, which provides a longer time frame for critics to attack the policy as ineffective. The transformation in examination content would result in some significant changes in high school education. The original purpose of the new policy is to expose high school students to different academic areas that emphasize a liberal arts and science focused education. Moreover, the policy aims to help students find the subjects that they are truly interested in and would like to further develop during their studies in university; this allows for a wiser selection of undergraduate majors and ultimately results in better academic and career development. By giving students more flexibility to select their area of specialization, the SMEC aims to create a new class of civil servants and professionals that are passionate about their work. But with the difficulties this policy implementation faces, there is a possibility that it may actually harm its objectives instead. . After interviews with headmasters of several major senior high schools in Shanghai as well as some randomly selected current high school students and parents, our research team has summarized three major potential problems of implementation. The first option no doubt incurs tremendous transactional cost. Administration at Jianping High School had an extremely hard time planning the schedule for the entire school so that students could take the courses they wanted while still being enrolled in mandatory classes, without creating scheduling conflicts. Both students and faculty seem to be very confused at the beginning of the semester when trying to figure out where classes are held. Faculty members now have triple the amount of classes to teach, which according to a teacher interviewed in the Wenhui report, makes it impossible for her to focus on teaching, get to know her students, and even collect homework. Jianping has it better. As one of the better schools in Shanghai, they have the resources to fully implement the reform in changing class structures. To many of the smaller schools, the second option would seem much more practical. However, schools facing a lack of deployable resources to accommodate all students’ needs have to make the decision of what combination of classes will be available based on the school's’ assessment of how hard the corresponding Gaokao exam is likely to be. In the implementation process of the reform, diversification of exam structure will most likely boost the quality of teaching in high schools with enough resources. In schools without sufficient resources, the reform’s positive impacts are likely to be minimal. The first two potential problems are closely connected; many students may choose the subjects that have relatively easier tests, instead of their subjects of interest in order to receive better grades that count into the total Gaokao score, which deviates from the original purpose of the experimental policy. Consequently, this is also one of the major causes of the unequal distributions of academic resources, because the biased subject selections would result in harmful changes to the composition of academic departments at high schools. For example, if chemistry is considered to be a comparatively easy examination, demand for that course will rise at high schools, affecting funding allocation for other departments and subverting the reform’s intent of creating not only more well-rounded students, but also students who can further develop their interests in university. The third main problem, regarding the CQE, is not so easily addressed. Criteria for this assessment have not been fully articulated, and the SMEC’s own documents do not delve into the specifics. To some, this is an intentional move to allow universities more autonomy in selecting their students, but to others, the movement away from a quantitative assessment to a qualitative model is fundamentally against the meritocratic intent of the Gaokao, which potentially creates unfairness and corruption problems. Ideally, the content of the CQE will be compiled fairly and impartially by high schools and sent to universities for review, but the nature of this content has not been set. The text of the SMEC’s reform roadmap vaguely describes “Chinese traditional culture accomplishments,” and “moral and political character” as essential elements, but does not clarify further. The incentive for high schools to conduct this process impartially is significant, as their reputation is at stake if a pattern of inaccurate reporting emerges. Nonetheless, the problem of corruption cannot be ignored. As universities are given more discretion, in addition to the monopoly they already have, the potential for corruption will rise. Students from wealthier or strong governmental family backgrounds may use their money and political power to unduly influence admissions decisions or use connections (guanxi) with university administrator, potentially creating the possibility for unfair evaluation (zhaogu) as the SMEC does not seek to reform the opaque nature of admissions deliberations. According to the Deputy Director of the SMEC, “there are all kinds of techniques that universities can design to avoid these potential problems and the policy makers know these techniques well. The real difficulty is not the techniques; it is whether the policy makers intentionally leave a flaw in the policy to benefit him/herself, and how the implementation takes place under his/her management and control.” Compliance will be difficult to ensure in this regard. The qualitative nature of the CQE assessment makes it easier to justify questionable admissions, but a movement towards more transparent admissions may counteract this, and thus we encourage movement towards this type of transparency. Our interview with a senior official at the SMEC revealed some larger structural issues within the organization and the policy. While the policy itself seems to have been drafted by an expert panel (as other interviewees informed us), the implementation at the SMEC level has been left to a skeleton crew. Currently, fewer than ten members of the SMEC are responsible for implementing the policy, which may lessen the effectiveness of what may be an otherwise sound plan. The policy’s flexibility here becomes a liability, as there is not sufficient infrastructure for review and implementation monitoring/evaluation. Due to such a small team, the SMEC personnel left in charge may be too powerful; if changes are subject to the whims of two or three highly placed individuals, the policy may become inconsistent with its initial vision and statement of purpose. Lack of redundancy and accountability in this area is a serious problem. This is a worst-case scenario, but not beyond the imagination. It is necessary to increase the number of personnel dedicated to overseeing and implementing the reforms in this area. According to our interview with Chancellor Yu, there are always enough techniques for anti-corruption; the real problem is that policymakers are usually the perpetrators who intentionally leave loopholes that provide opportunities for corruption. If power is left in the hands of only a few highly-placed officials, corruption is more likely but still not certain to occur. Therefore, to mitigate this possibility, the SMEC must increase their personnel. The two ends of the CQE have potential problems, especially in ensuring the fair evaluation of candidates and anti-corruption measures. Nevertheless, it is a paradox; mandating a rotating system of admissions officers may prevent corruption, as people seeking to pay rents may not be able to get into contact with the figures of influence they seek to bribe. On the other hand, this may adversely affect the consistency of admissions decisions, as rotating officers may not be fully familiar with institutional culture and the criteria desired for candidates. These admissions officers should be made aware of CQE requirements, enabling them to identify corrupt discrepancies between the CQE’s description of the applicant and the reality of the situation at hand. A robust and accountable interview process is absolutely necessary, and thus the SMEC should include this requirement. Admission officers should be cautiously selected. Half of the admission officers should be picked from the university admission office who are experienced enough to maintain both the consistency and the university culture in its admission policy; moreover, at least one university professor that is not usually on the university’s admissions board should join the team, in order to diversify the perspectives and increase the credibility of these boards. The other half of the admission personnel should be selected from a citywide pool of qualified admission staff via computerized random selection. By this method, the admissions decision makers are different each year and difficult to predict and track, which enhances not only the fairness of the admissions, but also maintains institutional standards for admission. Building in redundancies of this nature strengthens the policy going forward. Alternatively, a more collaborative solution to the CQE issue can be attained through close cooperation with universities. Consulting representatives of all admissions offices that the reform will affect to create a unified, citywide policy for the role of the CQE would make admissions decisions more transparent. The CQE and interview process should be considered as distinct entities, where discretion in interview content is allocated mainly to admissions officers and the CQE considered, separately. Lessons can be learned from other models of university admissions; for instance, According to Zhengji Wang, Deputy Director of Chinese Admissions of NYU Shanghai, the first American university in Mainland China, using “an external supervision committee in New York to review admissions decisions and prevent corruption is very effective.”Despite the fact that it is not possible for Chinese universities to have a completely separated supervising committee without internal administrators and staff at this stage, it is a good idea to implement a similar review board system across all universities may help minimize corruption in the admissions process. Making the standard admissions procedures known publicly, perhaps published through a central SMEC publically accessible database and advertising it through the official Shanghai government website, would introduce a greater deal of accountability and help students, administrators, and parents identify inappropriate or corrupt behavior. This database would potentially publish with consent the names of students who were successfully admitted, allowing both the media and the general public to help police the system, which is currently one of the most effective methods of anti-corruption supervision in China. While privacy is a concern in this type of system, the pendulum of anti-corruption and privacy in China swings firmly in the direction of anti-corruption. Nevertheless, the ultimate goal of the supervision aspect of the our solutions to the potential corruption problems of the CQE System is to establish an effective internal supervising committee; however, it would take time and would need to go through a certain procedure that our PAE team has designed, as the following flowchart shows. Stage 1: The establishment of a SMEC CQE Evaluation Committee would take up a large amount of government resources; during our interview with the deputy director, we discovered that the SMEC’s personnel and resources are not sufficient for this to be permanent since the Higher Education Division’s Gaokao Policy core team has no more than ten members. And if the newly established SMEC CQE Evaluation Committee members remain fixed over a number of years, it would be difficult to ensure that they are scrupulously fair as well. Moreover, this committee would be less familiar with each university's admission criteria and their unique models of nurturing talent. Hence, our team recommends a gradual devolution of the SMEC committee’s power; the ideal structure of this initial supervisory committee is having a sub-committee from the local Education Commission of each district, in charge of their respective districts. This would add to the system's accountability, avoid potential corruption problems, and set a precedent of accountability from the very beginning. Stage 2: The role of SMEC committee switches to a supervisory role, which gradually grants institutions full rights to select students. This solution mitigates the policy paradox between maximizing the autonomy of universities while ensuring fairness in selection; this step ensures a smooth transition of the role of the SMEC and its sub-committee from a fully involved role to a supervisory role, which conforms to the policy reform guidelines issued by the State Council. Stage 3: The student and faculty supervision committee takes over supervising responsibilities; students and faculty voluntarily sign up for positions on the board, filled through random selection by the SMEC before the admissions process starts, reporting internally to the SMEC committee. This new supervising System (监督机制Jiandu Jizhi) would not only enhance the efficiency of the CQE evaluation and admissions process, but also make the system more sustainable over time as the SMEC reduces the amount of resources dedicated to the process. Moreover, since Chinese universities have an administrative structure where the Chinese Communist Party (CCP) committee is separated from university leadership, the CCP division could also join the supervising system, in order to ensure the fairness of the CQE system in the realm of ideological politics. In short, the SMEC should at first take an aggressive and highly involved role in the selection committee process, eventually transitioning this role to representatives from district Education Commission, university officials, and university CCP representatives. Moreover, as discussed above, schools without sufficient resources to implement the policy will most likely not see much positive impact and indeed may be negatively affected. As a result, we recommend that the SMEC conduct a survey/study of resource allocation for secondary schools across the city before the reforms are fully rolled out. Should certain schools be found to have insufficient resources to implement the reforms, their personnel and resource budgets should be increased accordingly. The details of this survey would be highly provisional, but it is necessary that school’s self-reported needs are audited in order to prevent the reform from becoming too costly. Additionally, this resource allocation will level the playing field to some degree and potentially lead to overall better educational outcomes across the board in the city. Creating greater equality of opportunity in high schools may also allay fears about the decay of the Gaokao as an ostensibly meritocratic process. The distinction between “exemplary schools,” the title applied to elite schools by the SMEC, and ordinary schools is important in this particular area, as resource allocation differs across these designations in the current system. Potential participants in corrupt activity can be broadly categorized as government officials at different levels, ultra-wealthy individuals, members of the middle class, and education domain insiders; there are many different levels of people from different backgrounds in this way. The SEMC and its Sub-Committee, High School and College Leadership, and instructors are all also potentially susceptible to graft. Hence, our team analyzes them specifically and respectively, in order to make it easier for our clients and other readers to understand our policy recommendations in latter section. Moreover, Chancellor Yu informed our team that many instances of corruption in the SMEC or at higher levels are difficult to detect because there are not necessarily cash-to-cash trades; some corruption takes the form of trading for long-term political guanximaintaining and long-term potential mutual benefit in lieu of one-time exchanges. In the following hypothetical example, the Director of A Committee would help the son of the Director of B Committee get 10 extra credits in the CQE or Gaokao this year; and some time in the future, the Director of B Committee will help the daughter of the Director of A Committee get a well-paid job in a leading state-owned corporation under his administration, and vice versa. Furthermore, some instances of unfair and/or illegal treatment result from Chinese cultural traditions of “face” (面子mianzi), which refers to the connections and relations between people that make refusing requests difficult and embarrassing in a social context. 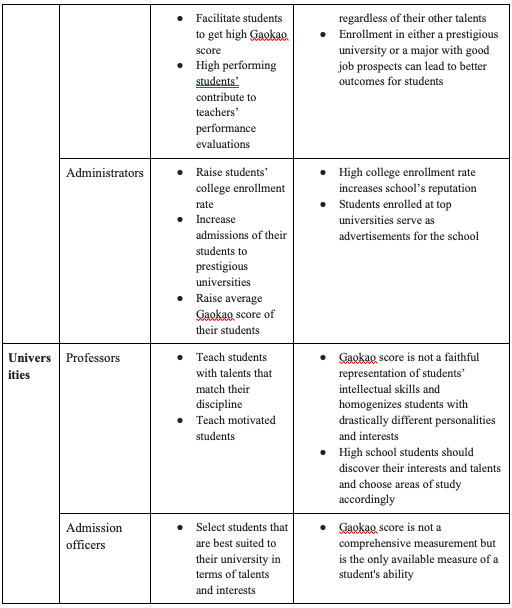 As mentioned previously, high school and college leadership are the main influencers in admissions materials collection and decision-making, respectively. On the high school end, leaderships might be called on by their supervisors, for instance, who are executives of Shanghai Municipal Education Commission or even higher-level administrators, putting pressures on them to provide some special regards to specific students, because of the aforementioned mutual benefits. Given the political structure of China, high school and college leaderships are parts of the political system, which complicates their decision making process. High school leadership, for instance, add those students’ names onto the list of outstanding students honors list to help them get extra credits after the list has been finalized. Similarly, college leaderships are also part of the political system; when leaders from upper administration request special consideration, they have to add several students’ names in the admitted students list even if it has already been finalized. Since there might not be direct one-time money-power exchange, it is not an easy task to establish a simple supervisory committee. The key problem is the political structure that Chinese college and high school leaderships are parts of the political system; despite that our PAE team’s desire for reform , the SMEC’s capacity is far from enough to address this. Hence, a simple supervisory system (Jiandu Jizhi) might not be effective enough; thus, there are two courses of action that are important for the prevention of corruption: publicizing results and a computer-based systematic entry system. Further details and policy recommendations will be explained in the latter section. Instructors directly connect with students and submit instructor evaluations, as part of the CQE system. In order to discourage the practice of instructors neglecting portions of the curriculum to boost cram school sign-ups, wages for instructors should be increased across the board. The average high school teacher in Shanghai makes roughly 5,000 RMB per month, which coupled with Shanghai’s rapidly rising cost of living, makes it difficult for teachers to survive on their government salaries. Increasing salaries to be more in line with the cost of living will discourage instructor corruption in all its forms, from cram school sideline businesses to outright bribery. Additionally, the merit pay system currently in place could be removed at least outside of “exemplary schools,” as it contributes to the cycle of low-performing schools attracting low-quality instructors, creating a linkage between corruption and resource allocation. 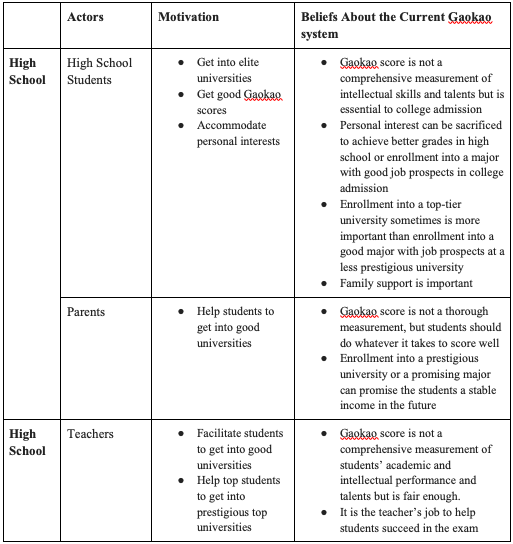 ● Ensuring a fair, detailed, and realistic appraisal of student performance. Teachers should monitor students to create an objective record of specific extra-curricular activities and enter this information into the IMS. High schools participating in the IMS should record students' military training, participation in civil defense activities, personal honors, discipline violations, curriculum performance, and research activities. Students' basic information, high school proficiency test scores, "National Student Physical Health Standard" test composite scores, and volunteer service (community service) should also be recorded. ● Supervising selection. Students should create a profile with a writing sample and basic information about themselves, linked to the assessment inputted by their instructors. Additionally, they should include whatever activities, especially research or papers they consider to be exemplary of their own work, as part of this self-created profile. ● Public review. All information should be recorded in the IMS. Students should be able to view their self-made profiles without being impeded. All edits to the records should be logged and linked to unique login credentials for each IMS participant, creating an accountable paper trail. ● Standardized format. The IMS should automatically compile all entered data for students during the application process. Students should sign and verify their records, as should their administrators and head instructor, before the materials are sent to the universities they are applying to in a sealed envelope to prevent tampering. ● Establish a transparent information record and management system. Instructors should tutor students to record their academic achievements, extra-curricular activities, and experience honestly and accurately in the CQE IMS. Moreover, all departments and government administrations that are related to students’ extra-curricular activities—namely the Shanghai Municipal Civilization Office, Shanghai Municipal Science and Technology Commission, Shanghai Municipal Sports Bureau—should liaise with each other and ensure the information and programs provided to students from different schools are identical and that evaluation standards are unified. This would not only discourage both individual corruption and group (school-wide) corruption effectively but would also provide students more opportunities for volunteer service (community service), sports, arts, and technology activities (extra-curricular), and research opportunities, in order to support experiential learning outside the classroom. Also, SMEEA, SMEC and district sub-committees should all have separate, redundant IMS databases in order to discover potential discrepancies and prevent unfair tampering with the database. Additionally, instructors and high school administrators should guide their students through the process of collecting their self-submitted IMS materials across all four years of school in order to avoid a last-minute stressful scramble. ● Establish an auditing system. Relevant social agencies may provide comprehensive quality assessment information (potentially involving shequ 社区neighbourhood organizations). Mandating that relevant administrative departments review the IMS entries for competitions and honors projects; schools, social agencies, county and municipal departments responsible at multiple levels of the process builds in an additional layer of redundancy. ● Establish a rating system to grade schools on their compliance with reforms. This would be run by the SMEC as an additional layer of oversight in concert with student committees, further discouraging corruption. Schools’ grades would be made publicly available, adding a layer of accountability to the process. ● The establishment of a public complaints system. Avenues to report potential corruption or half-hearted compliance with the reforms must be put in place. Additionally, feedback on the reforms themselves will be of great value to the SMEC as it moves forward, so this system is necessary to the reform’s success. Universities that find they have been provided with false information should report complaints to the SMEC Student Affairs Office. Should high school and community agencies report a complaint, the SMEC should act to lower the school’s rating or take action against whatever individuals were responsible once the complaint is verified. ❖ Why is our PAE is very useful? The policy is still open to alteration and the Shanghai Municipal Education Commission only has guidance from the Ministry of Education in Beijing; the implementation fully depends on the Shanghai Municipal Education Commission. As members of the inaugural class, we have witnessed NYU Shanghai’s student admission process, which is the “future model” of the Shanghai Gaokao admissions’ implementation; our fresh opinions have the potential to be useful for the implementing policy-makers. ❖ The risk of implementation and its pitfalls (misunderstanding, mistrust, coordination problems, implementation methods etc. ), also need solutions to potential corruption and inequality problems. Hence, our PAE is neither policy designing nor implementation problems analysis; it’s a combination of both as per Chancellor Yu’s recommendation. ❖ Implementation and people’s responses are more important than the design itself. ❖ No one knows how each university uses the Comprehensive Quality Evaluation system” (综合素质评价体系zonghe suzhi pingjia tixi) in 2017; they will release their own usages and interpretations of the new policy in 2017. We would like to give them the full rights to design their own procedure and criteria. Johnson is a business and finance major and member of the inaugural class of 2017 at NewYork University Shanghai. He has global interdisciplinary experience in both private and public sector, including private equity at China International Capital Corporation (CICC) and economic reseach at the U.S. Conference of Mayors. His research interests includethe inter-connected roles of business and public policy in the fields of both healthcare andeducation. Johnson is also the Founding Chairman of China League Hacking (CLH), the largest Hackathon group in China. Jenny is a senior at NYU Shanghai double majoring in Integrated Social Sciences and Integrated Humanities with a focus in Sociology and Public Policy. She is particularly interested in the demography of marriage, gender and family, as well as censorship and discourse changes in the cyberspace. In her time away from computer screens, she enjoys making tea for friends, trying out new recipes, late night piano practices in NYU Shanghai’s academic building, and the occasional luxury of binge sleeping. Amy is a graduating senior with a degree in Business & Political Economy from NYU Stern.Having worked at multiple early-stage startups, she is proficient in “growth hacking” andis happiest when scrambling to bring a product from ideation to market. In her free time, Amy is an avid painter and itches to debate someone on how certain political systems could be perfected through technology. After graduation, Amy will join IBM as a Global Business Services (GBS) consultant. China. Shanghai Municipal Education Commission. Shanghai Municipal Reform and Implementation Plan for College Entrance Examination. Shanghai: Shanghai Municipal Education Commission, 2015. Web. Cockain, Alex. "STUDENTS' AMBIVALENCE TOWARD THEIR EXPERIENCES IN SECONDARY EDUCATION: VIEWS FROM A GROUP OF YOUNG CHINESE STUDYING ON AN INTERNATIONAL FOUNDATION PROGRAM IN BEIJING." The China Journal No. 65 (2011): 101-18. JSTOR. Web. 21 Apr. 2015. Elmore, Richard F. Forward Mapping: Implementation Research and Policy Decision. Political Science Quarterly, Vol. 94, No.4 (Winter, 1979-1980) 601-606. The Academy of Political Science. Oct. 18th, 2005. Web. Hannum, Emily, Xuehui An, and Hua‐Yu Sebastian Cherng. "Examinations and Educational Opportunity in China: Mobility and Bottlenecks for the Rural Poor." Oxford Review of Education 37.2 (2011): 267-305. Web. Levin, Benjamin. "Knowledge Mobilisation and Education Policy Making in China." The Impact of Research in Education: An International Perspective. N.p. : n.p., n.d. N. pag. Print. Levin, Dan. "A Chinese Education, for a Price." The New York Times. The New York Times, 21 Nov. 2012. Web. Lu, Jing. Personal Interview. Apr. 13th, 2015. Lu, Jing. Shanghai Municipal Education Commission. 上海高中综合素质评价实施办法(征求意见稿). Feb. 16th, 2015. Peng, Zhang. "上海高中课堂，走班真的来了" 上海高中课堂，走班真的来了 Wenhui News, 20 Mar. 2015. Web. 22 Apr. 2015. Walker, Allan, and Haiyan Qian. "Reform Disconnection in China." Peabody Journal of Education 87.2 (2012): 162-77. Web. Wang, Zhengji. Personal Interview. Mar. 2nd, 2015. Weimar, David, and Aidan Vining. Policy Analysis. 5th edition. Part III, Chapter 12: Implementation. Pearson, 2011. Print. Woronov, T. E. "LEARNING TO SERVE: URBAN YOUTH, VOCATIONAL SCHOOLS AND NEW CLASS FORMATIONS IN CHINA." The China Journal No. 66 (2011): 77-99. JSTOR. Web. 08 Apr. 2015. Yan, Yiqi. Shanghai, Zhejiang to pilot gaokao reforms. China Daily USA. Sep. 20th, 2014. Web. Yu, Lizhong. Personal Interview. Mar. 2nd, 2015. Peng, Zhang. "上海高中课堂，走班真的来了"上海高中课堂，走班真的来了 Wenhui News, 20 Mar. 2015. Web. 22 Apr. 2015.